This site documents the timetables of passenger trains starting from, terminating at and passing through the various stations on the Hutt Valley Branch over the years. This page provides a summary - individual pages for each originating station provide the details. I have also included information on how the 1953 electric timetable was planned, the format of the public timetables, EMU destination codes and the general information sections in the timetables. 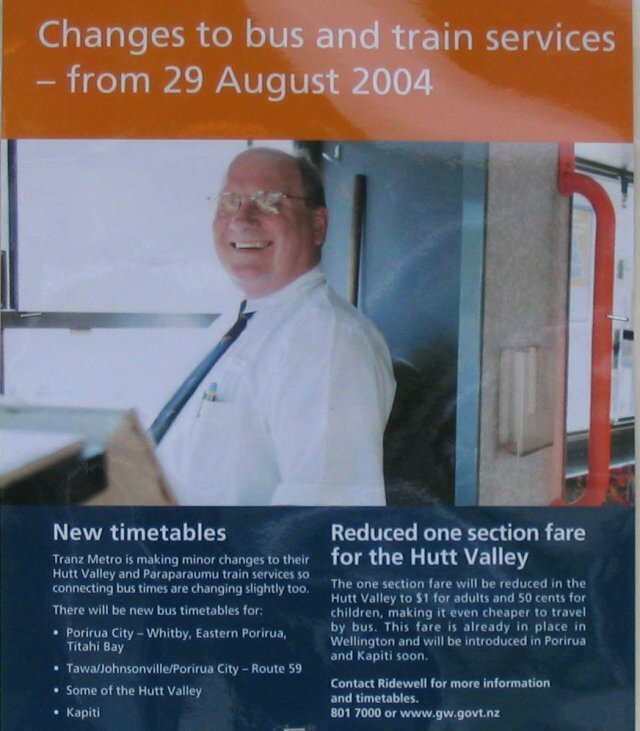 Note that the purpose of this page is to document the history of Hutt Valley train timetables. If you are looking for the current timetables you may find the Tranz Metro or Metlink sites more useful. PDF versions of timetables from 2004 onwards can be obtained from my downloads page. 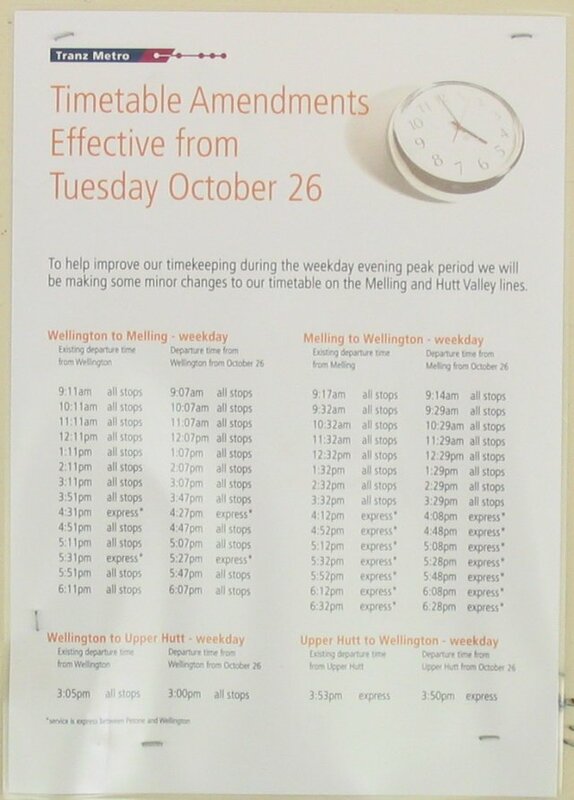 On 29th August 2004 a new Tranz Metro timetable was introduced.There were major changes to afternoon peak hour services to get the drivers (not the trains) back to Wellington more quickly. A Ridewell poster incorrectly described the changes as minor. Two months later, in October 2004, the timetable was re-issued again, with minor amendments. The minor differences between the August and October timetables were defined in a Tranz Metro poster displayed at railway stations. The old and new timetables were placed on the Tranz Metro web site in (pdf format) on 23/8/04. An eagle-eyed timetable enthusiast quickly discovered an error in the new timetable - it included the three peak Wairarapa services by mistake. Tranz Metro have discouraged Hutt Valley commuters from using Wairarapa services, imposing a minumum $6 fare. The error would have forced Tranz Metro to carry these passengers at normal fares. The new timetable was immediately removed from the web site but fortunately I had already downloaded it. Pdf versions of the April 2004, Incorrect August 2004, Correct October 2004 and the Christmas 2004 timetables can be downloaded from my Downloads page. On 4/9/2006 the Greater Wellington Regional Council (GWRC) took over reponsibility for the content and format of timetables. I have not yet added details of the new format to this site. On 20th February 2011 a revised timetable was introduced. Construction of the Hutt Valley Branch, from its junction just north of Petone, began in April 1925 and was completed as far as Waterloo in May 1927, with intermediate stations at Ava and Woburn. Automatic signalling was provided. Four overbridges were built over local roads so the branch did not have any grade crossings. Note that the junction was known as Hutt Valley Junction. It should not be confused with Petone Junction, which was south of Petone and the junction for the line built by the Hutt Park Railway Company along the Petone foreshore. A second line was constructed south from Woburn to provide access to the new Hutt workshops (which were opened in 1930), the Hutt Park Racecourse and industrial developments. After 1944 the rails were extended northward from Waterloo to serve the new housing areas of Naenae and Taita. Taita was reached in 1947. The extension was continued across the river to Haywards (renamed Manor Park) and back again to Silverstream. Upper Hutt trains were diverted to run via Waterloo and Taita from 28 February 1954. Between Waterloo to Wingate a further three overbridges were built. The first grade crossing from Wellington is now at Manor Park. Electrified services to Taita began in 1953 and to Upper Hutt in 1955. EMUs were used, supplemented during peak periods by ordinary trains hauled by electric locomotives. On 4 November 1982 carriage trains were replaced by EMUs. 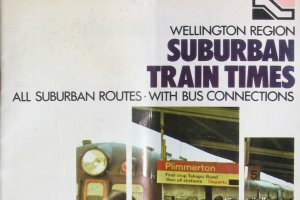 The 1980 public timetable includes a schematic of the Wellington electrified suburban railway system. For current Wellington suburban timetables visit the Tranz Metro or Metlink sites. Waterloo dep 6.50am, 7.16, 7.54, 8.15, 10.45, 11.33 am (Sat); 12.50 pm (Sat), 1.5 (not Sat), 1.50 (Sat), 2.30, 4.46, 5.50, 6.50 and 10.55pm. Wellington dep 7.15 am, 7.35, 10.0, 12.0 noon, (not Sat), 12.11 pm (Sat), 1.10 (Sat), 1.45, 4.0, 5.10, 6.5, and 10.15pm. For further particulars re times, also fares, see free pocket folder, obtainable at stations and Central Booking Office, Willis street, on 23rd. The official opening of the new Hutt Valley Railway Line to Waterloo Station will take place at Woburn on THURSDAY 26th inst. For the convenience of persons desiring to witness the function, a special train will leave Wellington at 2.0p.m. and run to Woburn and Waterloo. Return Special will leave Waterloo at 4.25 pm, arriving Wellington 4.56pm. The full timetable over this section of the line commences on FRIDAY, 27th inst. Visit the following pages for an analysis of weekday timetables. Note that timetables usually had a Monday - Saturday section and a Sunday section. In most cases I have therefore interpreted "weekday" as Monday - Saturday. Hutt Park, Hutt Workshops and Woburn Passenger trains to the Hutt Workshops and Hutt Park. Also describes how the Gracefield Industrial Line is operated in 2001. Melling Branch In 1954 the line north of Melling was closed and all Upper Hutt trains diverted to the Taita route. The Hutt Valley Junction - Melling section became a short branch worked by EMUs. This page includes Saturday and Sunday schedules. I compare the 1949 steam timetable with later electric timetables. Waterloo. 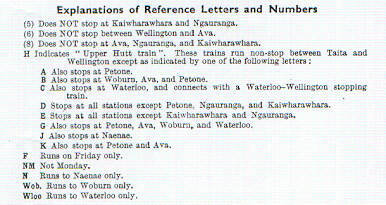 Documents the period from 1927, when the Hutt Branch Railway was opened to Waterloo, until 1947 when the line was extended to Taita. Naenae. For a short period in the 1940s Naenae was a terminal station. Study the timetable for this period. Taita. Full details of services from 1947, when the line opened to Taita, to the present day - including the 2001 timetable. Woburn. The times when a Woburn commuter could catch a train to Wellington. Upper Hutt. The times when an Upper Hutt commuter could catch a train to Wellington. Study the format of Hutt Valley public passenger timetables. 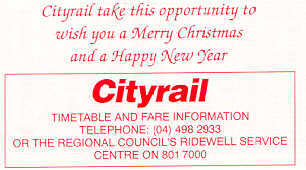 Special timetables are issued for the Christmas/New Year period. View the changing format of these timetables. To read about some of the issues considered when the 1953 Taita Stage One timetable was being compiled visit Planning The 1953 Timetable. Planning document from the early 1950s. The descriptions are based on Up (Wellington - Taita - Upper Hutt trains). 8 Taita; stops Petone, Woburn then all stations. 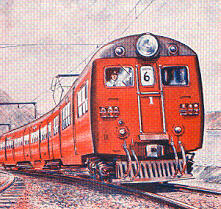 Drawing of an English Electric EMU from the Official Opening Ceremony leaflet, 12 October 1953. A timetable of the same date was distributed to householders. The timetable also had this drawing on the front. Upper Hutt trains were still routed via Melling in 1953. To read how the codes used varied from year to year visit my Destination Sign Details Page. Note that code 8 had two meanings. The originating stations reflect the extension of the Hutt Branch north through the valley. First Waterloo, then Naenae followed by Taita and finally Upper Hutt. The public timetables include trains originating from Woburn but these were in fact trains from the Hutt Workshops on the Hutt Park Line (now Gracefield Industrial Branch). In 2001 only Taita and Upper Hutt originate trains. Visit Originating Trains for details. Naenae storage siding stop block ( June 2001). Between 1955 and 1991 there did not seem to be any rational pattern to non-stopping trains. Various stations were skipped - Wingate, Naenae, Epuni, Ava and Ngauranga for example. Each new timetable introduced a different pattern. From 1991 the pattern has been much more consistant and in 2001 there is logic behind the stopping pattern. Visit Stopping Patterns for details. Look at some examples of the General Information sections in the public timetables. Public timetables in the 1950s contained some interesting notes on progress with the Hutt Valley Electrification and duplication scheme. Read some interesting local instructions from the Working Timetables. Some day I may add information on the following to this page - Saturday Schedules, Sunday Schedules. Details of my sources can be seen by clicking here.